Are you prepared to see the most notable names in music performing live at the DTE Energy Music Theatre?? That’s right, true folk rock legend James Taylor is teaming up with the prestigious blues musician Bonnie Raitt for an absolutely incredible tour!! They’ll be performing at the DTE Energy Music Theatre on Tuesday 8th August 2017. Make sure you’re there – get your tickets good and early, as this show, featuring such top-selling, award-winning musical talent, is going to sell out VERY fast!! One of the top selling music artists in history, James Taylor has seen sales of well over an incredible 100 million copies worldwide. His hit song “Fire and Rain,” blasted him into the charts in 1970, and he shortly had number one place as year later with “You’ve Got a Friend,” a much-loved cover of Carole Kind’s iconic song. 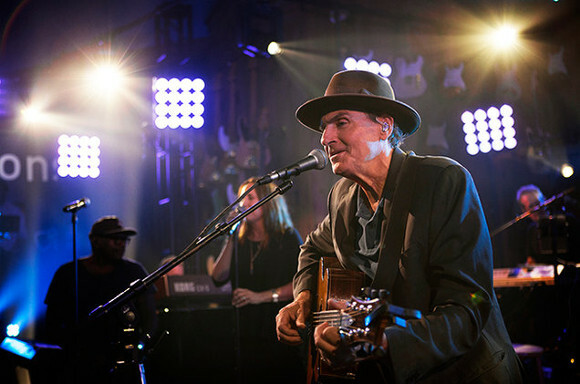 James Taylor went on to become well known for his covers and collaborations as well as his own original material, working with artists including but not limited to Sting, Neil Young, and Joni Mitchell. Joining him is highly esteemed blues-roots musician Bonnie Lynn Raitt. Her first few albums were released to a warm critical reception, but the general public didn’t get to discover her en masse until her 1989 album “Nick Of Time,” which catapulted to the number one position on the Billboard 200, winning 3 Grammy awards including Album of the Year, and the awards for best female Rock and Pop Vocal both. Selling over 5 million copies, “Nick Of Time,” set Bonnie Raitt on a trajectory of success that she has enjoyed with every album since. Don’t miss your chance to see these legends live in all their glory – book your tickets to see James Taylor and Bonnie Raitt TODAY! !